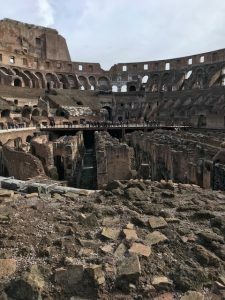 When I decided to study abroad in Rome, I knew I wanted to learn about the expansive history of the city and spend as much time as possible exploring ancient ruins. To my surprise I found exactly what I was looking for: a history of ancient Rome class offered by John Cabot University. 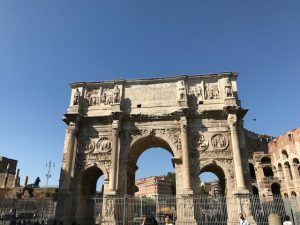 The cool thing about this class was that it was offered on sight; meaning that the ancient ruins and museums around Rome would be our classroom. I was overjoyed when I stumbled upon this course and could not believe that such a thing existed. What could be better than having a class inside the Colosseum! The ancient Rome course did not disappoint, it delivered everything I expected and more. It was cool to actually be excited to go to a class for once. It’s amazing how much more information you retain when you are actively involved and interested in the topics you are discussing, not to mention the fact that you are viewing the monuments in real life, whereas most people only are able to explore them through the pages of a textbook. I could experience the culture of the city and walk the path so many had taken before me; allowing me to feel and see the city from a perspective I would have never been able to see. My favorite class by far was the class which took place in the Roman Forum and Colosseum. 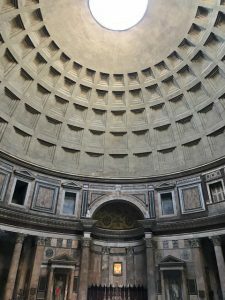 Our class walked through the forum amongst the 3000-year-old ruins and stopped to converse at important monuments, talking about their place in history. After leaving the forum we entered the Colosseum, walked around the entire thing and stopped many times to have class discussions. This was undoubtedly the coolest course I have ever taken and fully endorse that anyone studying in Rome take full advantage of this great opportunity. Drew was a fall 2017 SAI Rome student from the University of Tampa.